Do you want to invest in cannabis? Known by several names, such as marijuana, weed, herb, pot, grass, bud, ganja, Mary Jane, etc., 'cannabis' refers to the dried flowers of an herbaceous plant scientifically known as Cannabis Sativa, which also produces hemp. This paper is not about the moral aspects of the plant; it is merely designed to educate and inform investors on whether it is something they should have in their portfolio, in response to the almost daily questions I receive from investors young and old on this subject. Though cannabis has multifarious benefits, as a source of industrial fiber, seed oil, food, recreation, medicine, hemp rope, fabric, spiritual moods, etc., the societal stigma attached to marijuana consumption cannot be erased overnight. The legalization of cannabis has opened up a promising new market for many investors. So, naturally, people inquire about investing within the industry. Research indicates that the legal use of marijuana is on the rise globally, and statistics show a steady annual growth in the industry. Alaska, California, Colorado, Maine, Massachusetts, Nevada, Oregon, and Washington State already allow the recreational use of marijuana. Also, a total of 29 states have signed up for medical use of marijuana. Canada is scheduled to legalize marijuana in July 2018, and many other countries around the world are following suit. Using data provided by BDS Analytics, we predict that the legalized marijuana industry will grow from $6.5 billion in 2016 to over $24 billion in 2020. As a consequence, cannabis investment will be more prevalent than ever from this year onward. Recently, Apple allowed cannabis applications into its app store after many petitions from several cannabis companies. This is clear proof of a shift in the needle of mainstream sentiment about the plant's social acceptability. Cannabis stocks began in 2018 by extending a big rally that started in late October 2017, when Constellation Brands (STZ) announced a C$245 million investment into Canadian licensed producer Canopy Growth, with an option to double the stake to about 20% of the company at the time. The rally spurred gains of 150% from Oct. 27–Dec. 31, 2017, on the Cannabis Stock Index, which records stock exchange results for 75 cannabis corporations in the U.S., Canada and Australia. Through 2018's initial two trading sessions, the index gained 26.7%, which brought the total gains since Oct. 27, 2017, to 216.7%. This amount was corrected, but the index had still risen by 13.5% through Jan. 19, 2018. The legal use of marijuana has grown exponentially over the last few years and was valued over an estimated $6.5 billion in 2016 alone. Adult recreational and medical marijuana sales are expected to grow from $6.5 billion in 2016 to $24 billion in 2020. New Frontier Data reports that more than 250,000 jobs will come out of the legal cannabis market by 2020. Yes, this is a growing industry with massive potential, many aspects of which remain untouched by investors. Some states must define their marijuana legislation more precisely, for uncertain aspects of it make the procurement of loans, banking and credit cards hard for prospective consumers and businesses. Statelevel clarification of marijuana legislation would also make it easier for biotech and pharmaceutical firms to make marijuana-related investments and for financial consultants to serve cannabis companies with greater efficiency. The marijuana industry's reliance on hard currency with few financing or credit options makes legislation clarification even more crucial. Before the cannabis industry can explore alternatives to cash, it must tap into relevant financial markets, which is a challenge, since federal regulations discourage banks and insurers to do business with marijuana producers, distributors and research laboratories, who must rely on angel investors and credit unions for financing. The Cannabis Banking Working Group could now facilitate financing for the marijuana industry in California, but the availability of startup capital for marijuana companies in all states depends on the federal government passing the SAFE Banking Act or other protective legislation. Once that legislation passes, investment will grow in the burgeoning cannabis industry, sparking higher demand for financial catalysts for it. This could open up prospects for investments in producers of THC-infused skin patches and other new cannabis products, cannabis delivery and other specialized services, breathalyzers for drivers and other marijuana-specified technologies, and support services tailored to the cannabis industry: finance, insurance, logistics, medical and technological research, etc. 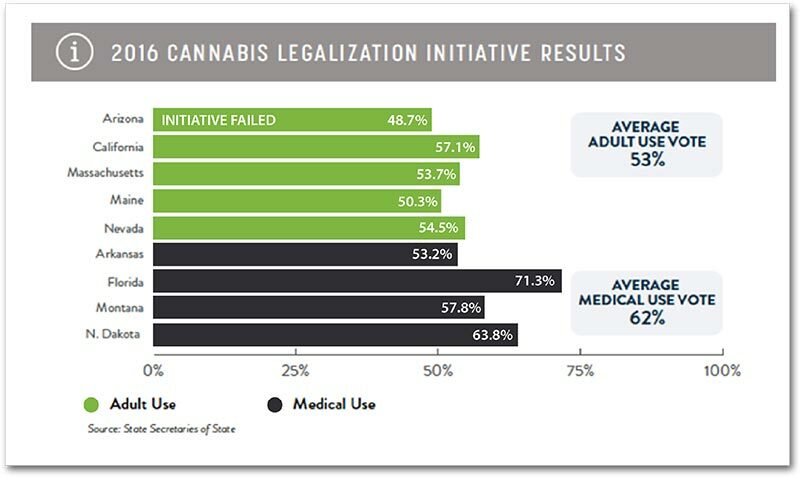 Making all of these things more possible is marijuana's changing stigma, resulting from increased access to marijuana for medical or recreational use. This has spurred greater demand for retail investment products, but they need investors and capital to continue to grow in the market. Federal regulations are now frustrating this growth, but we could see change in this as the cannabis market expands further. On January 4, 2018, Attorney General Jeff Sessions called for the revocation of the 2013 Cole Memorandum and enforcement of the Controlled Substances Act at the discretion of individual U.S. attorneys. This negate the Obama administration's allowance for state-legal cannabis operators and regulators to freely conduct business if they agreed to follow the Cole Memo's eight guidelines: no distribution to minors, no diversion of revenue to criminal organizations, no trafficking of cannabis products to other states, no use of cannabis businesses as fronts for other narcotics trafficking, no involvement of firearms in the cannabis trade, no driving during or after smoking marijuana, no raising of cannabis crops on federal lands, and no possession or use of cannabis on any federal property. Sessions' statement read: "It is the mission of the Department of Justice to enforce the laws of the United States, and the previous issuance of guidance undermines the rule of law and the ability of our local, state, tribal, and federal law enforcement partners to carry out this mission. Therefore, today's memo on federal marijuana enforcement simply directs all U.S. Attorneys to use previously established prosecutorial principles that provide them all the necessary tools to disrupt criminal organizations, tackle the growing drug crisis, and thwart violent crime across our country." It's no wonder Sessions and the Department of Justice repudiated the Cole Memo. A marijuana legalization ballot question dominated Election Day 2016. Voters in California, Maine, Massachusetts and Nevada said yes; Arizona voters said no; and Arkansas, Florida, Idaho and North Dakota voters approved cannabis use for medical purposes only. Many worried that Trump's upset victory and Congress's Republican takeover would threaten the prospect of changes to federal policy geared toward the cannabis industry. Sessions vilified cannabis during the early 2017 Senate Judiciary confirmation hearings, calling for the Department of Justice's absolute enforcement of the Controlled Substances Act and congressional changes to any inapplicable laws. Given this, Sessions may unwillingly become an ally of the movement to legalize cannabis if cancellation of the Cole Memo impels Congress to amend relevant laws. This would not likely lead to automatic national legalization of marijuana. However, new congressional legislation could respect individual states' rights In marijuana matters and clarify many vague areas such as banking, research, and issues pertinent to veterans wishing to use medical cannabis without losing benefits. 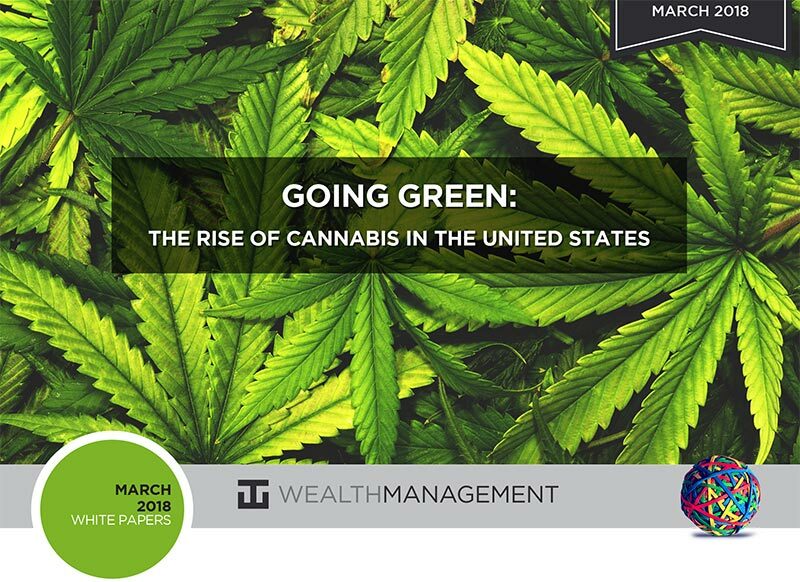 There are few cannabis investment options WT Wealth Management would endorse, as marijuana is still against federal law, and access to US-based cannabis-related companies are slim. Many investors invest directly through limited partnerships in either grow facilities or legalized storefronts. Some investors even purchase cannabis-related stocks traded on the Canadian Stock Exchange. One domestic US based ETF that we feel comfortable allocating to select client accounts trades more than 600,000 shares daily, and its liquidity is ample. A position like this, however, must be closely monitored and used in control allocations, as any adversarial movement from the Department of Justice could have a swift, severe effect on this type of investment. However, in moderation its rewards probably outweigh its risks, for marijuana legalization in large, populous states like California would make reeling in an entire industry more costly than beneficial. Cannabis and related industries will grow tremendously in the coming years. Although the industry currently cannot advertise on Google Adwords, Facebook, or any other common platform because of how that could harm its present partnerships and user base, advertising possibilities for this billion-dollar industry will become unlimited as the use of marijuana becomes more socially mainstream. The summary section is brief—either you believe in cannabis or you don't, and you would either like to invest or not. True, many issues are "gray," but after speaking with investors, I believe people will have very strong black-and-white feelings on investing in this emerging industry. So if you are inclined to explore an allocation to the cannabis industry, please contact us to discuss it. Benjamin, Abby, and Robert Vanisko. "Legal Marijuana Industry to Generate $40 Billion in Economic Impact by 2021." BDS Analytics, January 2, 2018. Borchardt, Debra. "Marijuana Industry Projected To Create More Jobs Than Manufacturing By 2020." Forbes, February 22, 2017. Brochstein, Alan. "Cannabis Stock Investors Should Pay Attention to the U.S. Federal Policy Change." Forbes, January 21, 2018. Gailey, Gretchen. "New Frontier Data: U.S. Cannabis Market Creates 283,422 Jobs by 2020." New Frontier Data, February 22, 2017. Robinson, Melia, Jeremy Berke, and Skye Gould. "This Map Shows Every State That Has Legalized Marijuana." Business Insider, January 23, 2018. Rolph, Duncan. "Marijuana is the Next Big Investment, but Here's Why Most Investors will Have to Wait." Forbes, December 12, 2017. Sayles, Justin. "Joint Ventures." The Real Deal, January 19, 2018. WT Wealth Management is a registered investment adviser in Arizona, California, Nevada, New York and Washington with offices in Scottsdale, Flagstaff, Sedona, AZ, Jackson, WY and Las Vegas, NV. WT Wealth Management may only transact business in those states in which it is registered, or qualifies for an exemption or exclusion from registration requirements. Individualized responses to persons that involve either the effecting of transaction in securities, or the rendering of personalized investment advice for compensation, will not be made without registration or exemption. WT Wealth Managements web site is limited to the dissemination of general information pertaining to its advisory services, together with access to additional investment-related information, publications, and links. Accordingly, the publication of WT Wealth Management web site on the Internet should not be construed by any consumer and/or prospective client as WT Wealth Management solicitation to effect, or attempt to effect transactions in securities, or the rendering of personalized investment advice for compensation, over the Internet. Any subsequent, direct communication by WT Wealth Management with a prospective client shall be conducted by a representative that is either registered or qualifies for an exemption or exclusion from registration in the state where the prospective client resides. For information pertaining to the registration status of WT Wealth Management, please contact the state securities regulators for those states in which WT Wealth Management maintains a registration filing. A copy of WT Wealth Management's current written disclosure statement discussing WT Wealth Management's business operations, services, and fees is available at the SEC's investment adviser public information website – www.adviserinfo.sec.gov or from WT Wealth Management upon written request. WT Wealth Management does not make any representations or warranties as to the accuracy, timeliness, suitability, completeness, or relevance of any information prepared by any unaffiliated third party, whether linked to WT Wealth Management's web site or incorporated herein, and takes no responsibility therefor. All such information is provided solely for convenience purposes only and all users thereof should be guided accordingly.